Aspergillus niger codon-optimized (CO) eforRed chromoprotein encoding gene. We transformed Aspergillus niger with this construct after adding a mitochondrial signal sequence in order to show targeted organell colourization. Finally, on the day of the wiki-freeze, we observed the red mycelium (Fig.1)! 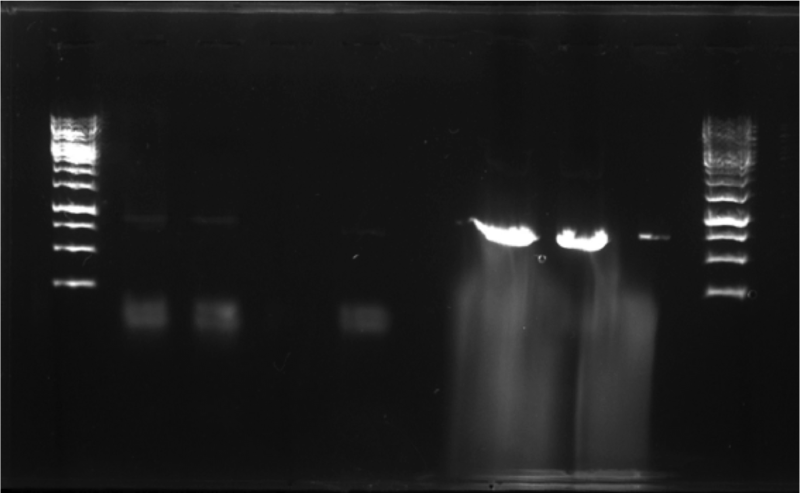 We performed PCR on our construct in fungal DNA and on our construct in the biobrick backbone as a positive control (Fig.2). The PCR showed faint bands for amplification of the transformant fungal DNA, while the bands for the positive controls were much more intense. The reason for this discrepancy might be that the (biobricking) primers we used fully anneal to the positive controls, while it only anneals partly to the eforRed sequence in the fungal DNA. This part was expressed under control of our pkiA biobrick. Chromoproteins have visible, intrinsic colours which are visible to the naked eye. This feature, as well as their small gene size, makes them feasible reporter molecules, i.e. as elective markers in co-transformations. We codon-optimized (see design) this eforRed chromoprotein for usage in Aspergillus niger, thus trying to expand the usage of chromoproteins from prokaryotes to eukaryotes. So far we've observed red colour intensity in the fungal colonies. We also tested the usability of our synthetic eforRed construct in E. coli. Results for this have not yet been obtained.